Stained Glass is another skill that Nancy was interested in, so she taught herself many years ago, making simple stained and etched glass awards for sailing events. She move on to larger, window-sized works and even very large church windows. 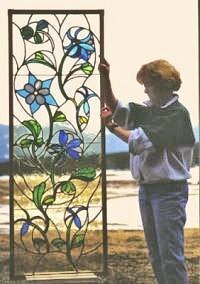 Her stained glass work is modern, something she describes as trying to emulate “water colors with glass”. She starts with a sheet of paper and color pencils, working an idea into lines that can be cut from glass, adding colors to achieve the desired result. If the sketch looks right, it is then transferred to paper that is the actual size of the final work, and this paper when laid out on a flat sheet of wood then becomes the template for the glass and lead work. She has done a number of special window projects for other churches and chapels, both new works and restorations. Shown below are works for two Granby, CO area churches. 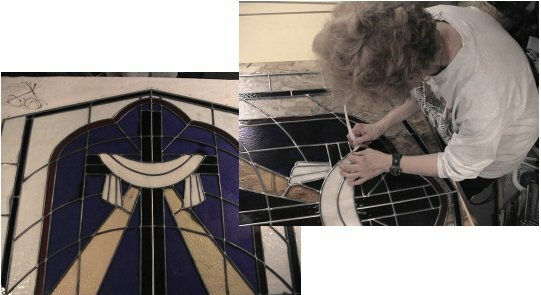 First is the center window of a three-window project, a design of her own to compliment existing windows at the opposite end of the church.